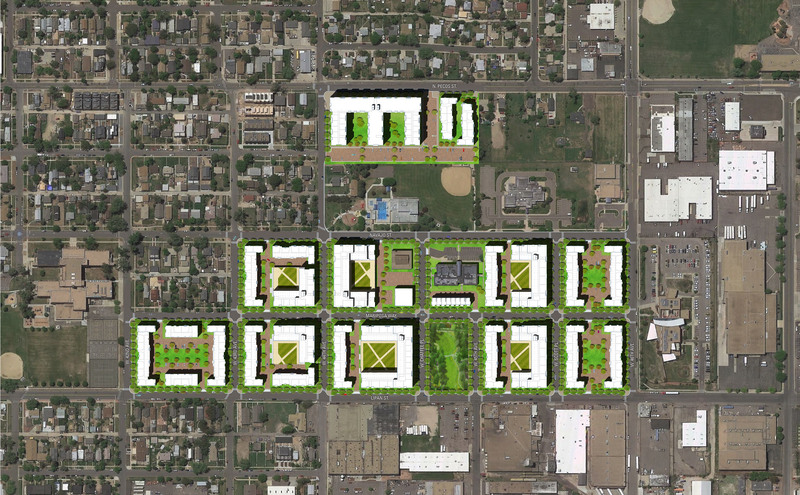 The existing Quigg Newton Homes spans 5 blocks over 22 acres and 72 buildings/380 dwelling units in an urban neighborhood that is integrated with recreation and health services. The redevelopment contains a mix of housing types that include Townhouses, 3-story Walk-ups and 4 & 5-story podium apartment blocks for a total of 1294 mixed income dwelling units. The new street network of 11 blocks includes an urban park, green infrastructure, senior living and retail. With the long term housing crisis in the Denver metro area projected to last, the Denver Housing Authority is leading the way with innovative solutions to mitigate the underdeveloped affordable housing market by leveraging property under their control. This project will increase the current 380 antiquated public housing units to over 1,294 mixed income units in a secure and vibrant new neighborhood, and be phased such no resident will be displaced during the redevelopment.